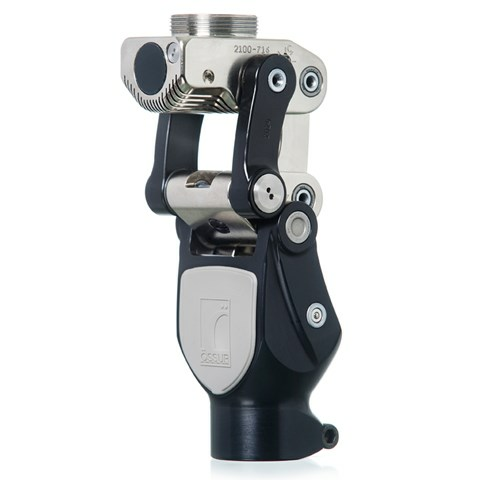 The Total Knee 2100 is a highly refined polycentric knee with 3-phase hydraulic swing control designed to withstand the rigors of more active amputees. With a weight limit of 125kg (275lbs) and 25% increased fluid capacity over Model 2000, the Total Knee 2100 offers the ultimate in stability, control, efficiency and durability. Polycentric knee designed for multi-speed ambulation, higher impact levels and heavier loads. Low build height, useful for long transfemoral limbs or knee disarticulation. Daily activities involving average walking with the ability to vary speed or walking pattern. Example: Going to the shops, confident outdoor walking. Daily activities involving fast walking, jogging and climbing stairs. Example: Heavy-lifting, manual labor, recreational sports. Activities involving running, track and field, sprinting, and long-distance running. Example: Track and field sports. Note: Responsibility for accurate coding lies solely with the provider treating the patient. Össur assumes no responsibility or liability for the provider’s coding decisions. Össur’s coding suggestions rest on its best judgment and are subject to revision based on additional information or changes in the alpha-numeric system. Warranty: 24 month limited warranty. Össur operates a quality management system that meets the requirements of ISO 13485 and 14001. Products are CE-marked and conform to standards and other normative documents outlined in the EC (CE) Declaration of Conformity.